Stuck on the load screen. Seeing a popup message indicating you are disconnected from the server. 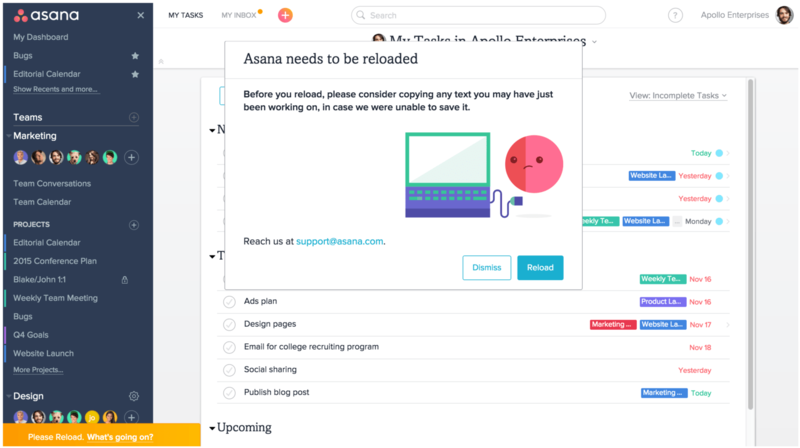 Seeing a popup message indicating Asana needs to be reloaded. If you see a unique error phrase, be sure to note it down so that you can send it to our Support Team if the troubleshooting tips below do not resolve your issue. If you are still experiencing issues after trying the steps above, contact our Support Team. Be sure to indicate exactly which steps you’ve already tried so that we can better assist you. If you’re using Chrome, try using an Incognito window (which does not employ your installed extensions) to use Asana. Asana only supports the most up-to-date, official browser version. 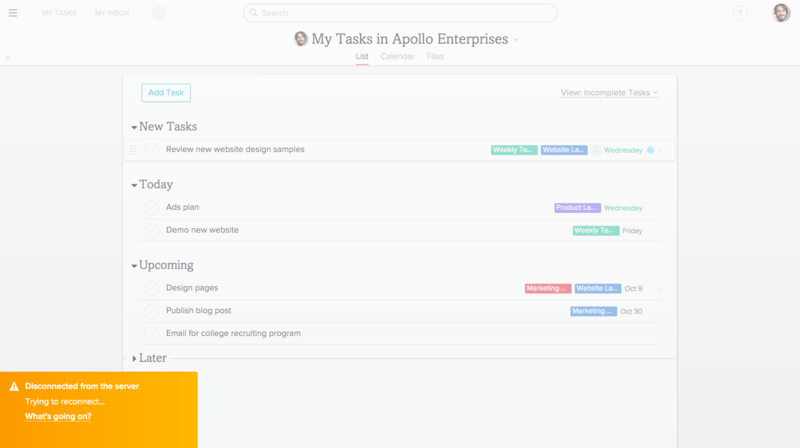 You may run into issues with Asana if you are running an outdated version of a browser. Ensure you have the best possible experience with Asana by updating your browser to the latest version. Uncheck the Passwords box when clearing your history if you want to retain any passwords you have saved in your browser. We test and develop for the list of compatible browsers and block access to Asana from those browsers listed as incompatible above. This is in order to protect your data. At Asana, security is our top priority. Your web browser may be using an older encryption protocol, TLS 1.1, which has security flaws. To ensure the highest security standards, we are making improvements and retiring older encryption protocols in line with other software providers. This means that we no longer support TLS 1.1, and recommend that you update to version 1.2 or above. More technical details can be found at our developers site. Some older versions of browsers support TLS 1.1 by default, but you can manually enable TLS 1.2 by updating your browser to its most current version. If your company’s IT team does not allow for browser updating, you will need to enable TLS 1.2 manually to ensure that you can continue to use Asana without any issues. All up-to-date browsers support TLS 1.2. If you are using any browsers that do not support TLS 1.2 at all, you will have to update your browser to a version that does support TLS 1.2 in order to use Asana. If you are using any browser that supports TLS 1.2 but not by default, we encourage you to update your browser to a newer version that does support TLS 1.2 by default. If your network IT does not allow you to update your browser, you’ll have to enable TLS 1.2 from your browser’s settings. If you believe your browser is up-to-date and you’re experiencing issues, you can verify the security of the TLS your browser uses here. If the page above shows that you are on TLS 1.1, you’ll have to work with your company’s IT team to update your connection to TLS 1.2. You are required to use WebSockets in order to use Asana and ensure that our latest version of the product works properly. Some Asana users may experience issues connecting over WebSockets when behind strict corporate firewalls or when using aged antivirus software.